The OLED55C6V is quite simply the best OLED TV yet. It looks gorgeous, particularly if curved screens are your thing, and unprecedented black levels help to deliver picture quality that is, for the most part, dazzling, as LG continues to refine its technology. While there's always been a lot of excitement around OLED technology, it seems to have reached fever pitch this year, and it's easy to see why. Having already greatly improved the performance and affordability of its OLED TVs last year, LG – the only brand currently making full ranges of OLED TVs – is claiming further substantial performance boosts and key new features for its 2016 range. 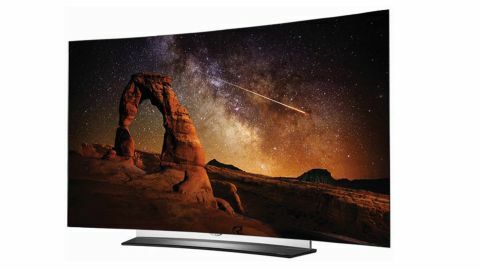 The first of these potential OLED dazzlers to come our way is the OLED55C6V: a 55-inch curved-screen model boasting a native Ultra HD Resolution and support for both high dynamic range (HDR) and 3D playback. As usual with an LG OLED TV, the OLED55C6V is seriously easy on the eye. The curved screen gets it off to a good aesthetic start, and the way the edges of the screen curve slightly forwards also makes it easier for jealous friends and family to notice how incredibly thin – sub 3mm – the screen is over the majority of its back side. Completing the sumptuous elegance is a really attractive metallic silver trim that runs around the screen's outer extremities. Connections are built into a protruding section of the rear, and chiefly comprise three HDMIs, three USBs and built-in Wi-Fi. Two of the HDMIs can handle UHD HDR sources like Ultra HD Blu-ray players and the Nvidia Shield, while the USBs can play most types of multimedia files. The Wi-Fi network option supports multimedia streaming from DLNA-enabled devices on your network, or app downloading/video streaming from LG's walled garden of online content. This online content includes such key services as the 4K and HDR-capable versions of Netflix and Amazon Video; the Now TV service; and, for the first time on an LG smart TV, all of the 'big four' UK catch up TV services: BBC iPlayer, ITV Hub, All 4 and Demand 5. The catch-up channels come within a new Freeview Play 'wrapper', which enables you to access their on-demand content via either direct apps or an electronic programme guide that scrolls seven days back as well as forwards. All of the OLED55C6V's myriad content sources are accessed through the third generation of LG's webOS platform. Given that webOS remains the slickest and most brilliantly simple smart TV interface in the business LG has sensibly not tinkered with it too much for 2016 – and the two main changes are positive ones. One is the addition of a My Content section, into which you can easily bookmark favourite sources for quicker repeat access, while the other cuts down on the use of sub-menus by enabling more apps to be added to the main scrolling content bar. It's the OLED55C6V's picture technology, though, that's the main attraction, chiefly because the OLED panel at its heart is the only display technology consumers can buy today in which every pixel in the picture can produce its own light and colour. It's pretty easy to appreciate the potential benefits this level of light accuracy should be able to deliver where contrast is concerned, and it's a benefit that's become even more important now that HDR has well and truly arrived on the AV scene. After all, I've yet to see any LCD TVs that are able to deliver dark HDR scenes with complete conviction, on account of their use of external light systems that can only illuminate large groups of pixels, or even the whole screen, simultaneously. Also noteworthy on the OLED55C6V are its claimed picture improvements over 2015's OLED models. For starters, brightness has been greatly increased in a bid to deliver more of HDR's thrills. But also on offer are expanded colour performance, claimed to deliver more than 95% of digital cinema's DCI-P3 colour spectrum (just the job for handling the expanded colour gamuts associated with the vast majority of HDR content), and improved light control that should significantly reduce 2015 OLED's issues of uneven 'bands' of light and sudden shifts from black to grey during dark scenes. Dolby Vision also delivers a degree of optimisation for the particular TV screen it's being viewed on. No other TV brand in the UK currently supports Dolby Vision – and some rival brands appear at the moment to be fairly openly hostile to it. It's also the case that at the time of writing there's only one Dolby Vision source available to UK TV viewers: Netflix. And even Netflix currently only offers a single Dolby Vision show (Marco Polo). However, Netflix has pledged to considerably up its Dolby Vision output in the coming months, and Amazon Video has also announced that it'll be introducing Dolby Vision support later in the year. So, given that the OLED55C6V offers Dolby Vision support alongside support for the more common HDR10 system rather than instead of it, you can't help but think that LG has been quite canny in covering all the HDR bases. One last feature to mention here is 3D – unlike any Samsung or Philips TVs this year the OLED55C6V supports playback of the third dimension using the flicker-free passive system.